What Midwives & Students Need to Optimize their Impact. You want to be the best midwife or student-midwife possible. After all, whether you’re a student, clinician, educator, or taking on another role, you’re putting yourself on the line every day. There’s one way to maximize your impact and experience: Membership in ACNM. Support and Welcome. We’ve got an amazing members-only platform called ACNM Connect. On it are scores of communities ready to embrace you. Engage, ask questions, learn, and grow. Find your communities here--Students, Midwives of Color, Gender Equity, Midwives in Support of Life, Retired Midwives, Global, Educators, and Midwives for Universal Health Care--to name a few. Or, start your own! A Strong Professional Network. Networking is essential to an optimized, productive, and fulfilling career. ACNM gives you easy, painless entree to like-minded peers, professionals, and potential mentors. Our events, affiliate meetings, and volunteer opportunities offer invaluable facetime and make connecting with others effortless. Our Professional Directory. Direct access to the largest network of CNMs/CMs in the United States and beyond is at your fingertips. A Way to Represent! Our members come from all walks of life. They are raising their voices and creating change within and beyond the college. However you affiliate, whatever your stand, where one voice is not enough, collectively, you can forge a pathway for change. Confidence. “Member of the American-College of Nurse-Midwives”--these words inspire confidence among patients, employers, and other professionals. Membership shows you are committed to your profession and that you adhere to the highest standards of care. Volunteering Opportunities. Plug in where, when, and how you like. We recently overhauled our volunteer structure to make it easier than ever to make a meaningful contribution that suits you. Learn more about volunteering via our Volunteer 411 presentation. Scholarships and Fellowships. More than $25,000 in support is provided yearly from the A.C.N.M. Foundation, Inc. to our student members. Experienced midwives can qualify for highly coveted ACNM Fellowships and other opportunities. Learn more. Awards. Each year, ACNM offers meaningful awards in more than 10 categories including Outstanding Preceptors, Outstanding Teachers, and Distinguished Service and honors a new class of ACNM Fellows for their leadership, clinical excellence, and professional achievement. Get recognized. Learn more about ACNM awards here. Leadership Skills. ACNM makes it easy to grow your leadership skills and capacity. There’s leadership development training at our Midwifery Works meeting, Diversity & Inclusion training opportunities, and and plenty of informal mentoring by fellow members who want to see you succeed. Benchmarking for Success. Through ACNM’s Benchmarking Project, you can compare your practice with similar ones, demonstrate improved outcomes, assure quality, and qualify as a “Triple Aim Best Practice.” Learn more. A Mighty Lobbying and Advocacy Team that’s got your back 24/7. They helped to pass 3 major bills in 2018 that will lead to 1) better rural maternal health care, 2) the right for certified nurse-midwives to offer medication-assisted treatment for substance use disorder, and 3) standardized and supported maternal mortality review committees in all 50 states (And, they'll include midwives on them). Next up, equal reimbursement and full practice authority support as the tip of the iceberg. Your Finger on the Policy Pulse. ACNM keeps you informed and lets you know key times to raise our collective midwifery voice. Midwifery Branding. We’re rebranding actively on Capitol Hill and elsewhere so legislators, consumers, and stakeholders can see who CNMs/CMs are and the many ways #MidwivesMakeaDifference. The ACNM Annual Meeting & Exhibition. If you haven’t attended lately, you’re missing highly rewarding educational sessions, key skill-building workshops, and loads of other energizing events and experiences. Learn more. The Journal of Midwifery & Women’s Health. ACNM’s must-read, highly rated peer-reviewed journal consistently ranks among the college’s most valued benefits. It is, alone, worth the cost of membership. Learn more. ACNM SmartBrief, our skimmable e-news brief, curated just for midwives. Know as soon as a new guidance or recall hits. Enjoy “What we’re reading now” and see what’s trending on social. Practice Support Publications, including white papers, clinical bulletins, position statements, and updated core competencies, all of which are your foundation for midwifery excellence. Midwifery Now, our biweekly e-newsletter highlights what’s going on in the college, including award and scholarship announcements, product sales, legislative updates, and more. Quickening, ACNM’s membership-only digital news site. Quickening makes it easy to share your perspective, clinical “how-to,” or reflection. Enjoy articles, personal essays, and opinion pieces from content from students and other members working in the United States and globally. ACNM at the Table. You say, “We want ACNM involved with the Alliance for Innovation on Maternal Health.” We’re a founding member and highly involved. Wherever organizations are gathering to strengthen maternal and women’s health, we’re there. Initiatives You Care About, including the Reducing Primary Cesarean Project. Now in its fourth year, the RPC project is helping hospitals reduce their primary cesarean rates by up to 18%. High-impact US and global grants. Whether we’re teaming up with the University of Alaska on Fetal Alcohol Spectrum Disorder or promoting physiologic birth in Madagascar, ACNM-led midwives are boots on the ground fostering respectful, high-quality care. ACNM books, ebooks, and presentations, such as Nitrous Oxide as an Analgesia for Labor & Birth, Into the Light of Day, and The Pearls of Midwifery (updated for 2019) explain the art and evidence of midwifery care. Discounted Registration at the ACNM Annual Meeting & Exhibition, plus free meeting-related CEs. Free CEs through the CEU issues of the Journal of Midwifery & Women’s Health. A 20% Discount on “Advanced Evaluation & Management of Psychiatric Illness in Reproductive Age Women,” the acclaimed on-demand course. Discounted Online CE offerings at the ACNM Online Learning Center and discounted and free CEs through your state affiliate. Members-only Sales and Discounts on midwifery books, gear, clothing, and gifts at the ACNM store. 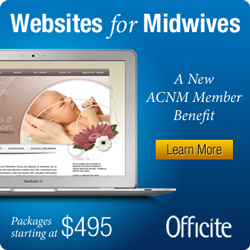 Free Listing in Find-a-Midwife, our national online practice locator. Discount on Affiliate Membership with the American College of Obstetrics and Gynecology (ACOG), which offers 30+ additional benefits, including the ACOG app, the Green Journal, lower-cost Pearl Insurance, obstetric record forms, professional liability resources, student loan refinancing, and more. Offered annually to ACNM members from August 1 to September 30 each year and made possible by a partnership with ACOG. Learn more. With all of this, midwives and other maternal and women's health professionals and friends can't afford not to join! Find out about the Benefits of ACNM Membership here: View our Student Flyer. See what ACNM has been up to. Read our 2018 Year in Review newsletter.